In our last tutorial we have explained how to configure and perform transaction management within the database using Spring Framework with JDBC and Annotations. In this tutorial, we are going to explain how to configure and perform transaction management within the database using Spring Framework with JDBC and Schema. But, in case of performing transaction management within the database using Spring Framework with JDBC and Schema, we don't need to change anything in the source code, rather we configure the transaction management using the configuration xml file. 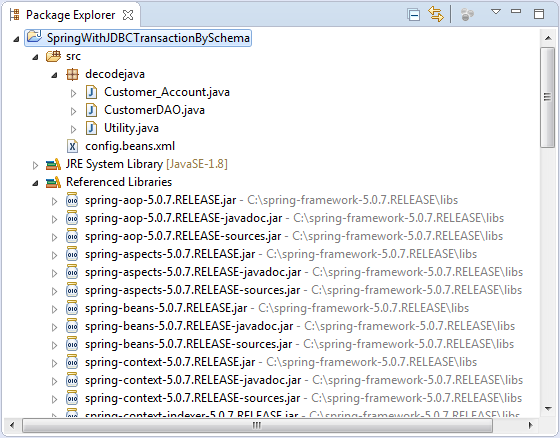 What Spring-JDBC transaction management by Schema does? Before we proceed with the database transaction management, we would first need to configure Spring Framework to work with JDBC. To perform this, we will use a very important template class provided by Spring Framework which allows us to perform JDBC operations, named - JDBCTemplate. This class is also going to contain a JdbcTemplate property named jdbcTemplate, used to perform JDBC operations using Spring. <tx:advice> - This tag has a transaction-manager attribute which connects the transaction manager class with the class that is going to perform transaction operations through its methods. The method attribute is used to specify the method of target class which is performing the transaction operation. The propagation attribute is used to specify the transaction behaviour i.e. REQUIRES_NEW specifies that the associated method should be executed in a new transaction. The isolation attribute is used to specify the way of configuring the concurrent transactions i.e. DEFAULT specifies that a default isolation levels defined in relational databases. The rollback-for attribute is used to specify checked exception classes. The transaction will be rolled back when any of the specified exceptions are thrown during the runtime of exception. <aop:advisor> - This is a child tag of <proxy-target-class> tag and it is wire the pointcut expression with the advice. The advice-ref attribute is used to refer to the advice mentioned within the <tx:advice> tag. The pointcut attribute is used to specify a pointcut using its attribute - expression. Project Folder - SpringWithJDBCTransactionBySchema is the name of our Project and it is a top-level directory. And, this concludes performing transaction management by configuring Spring Framework with JDBC using Schema.